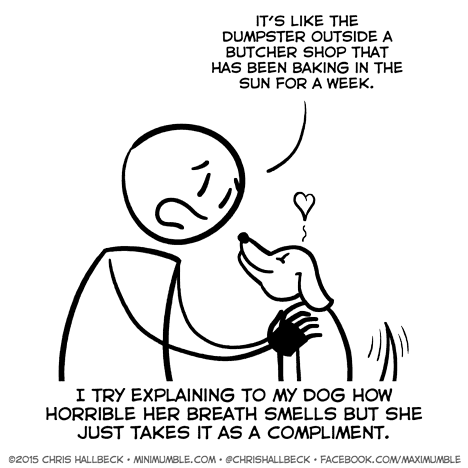 There simply doesn’t exist an equivalent of “garbage smells bad” in dog language. And yet their mouths are supposedly cleaner than ours. This will probably sound very strange, but my dog’s breath doesn’t smell of anything, really. The cats, however… All of them have this (literally) fishy kind of breath, and I can’t stand that kind of smell. It’s almost as if no matter what the cat food is supposed to taste like, it still makes their breath smell like fish.